The VIA VX900H media system processor provides DirectX 9.0 integrated graphics, crystal clear HD audio and Gigabit networking. Rear panel I/O includes a GigaLAN port, an HDMI port, a VGA port, four USB 2.0 ports, a serial port connector, a DC-in jack (manufacturing option) and both line-out and mic-in jacks. 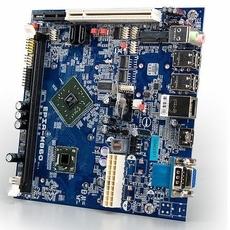 On board connectors provide a wealth of options including a PCIe Gen2 x1 slot, a Mini-PCIe socket, and a PCI slot, two SATA connections, two voltage selectable RS-232 pin headers (selectable to 5V/12V), two USB pin-headers for three ports and an additional three COM ports.